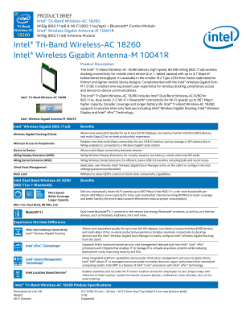 The Intel® Tri-Band Wireless-AC 18260 delivers high-speed, 60 GHz WiGig (802.11ad) wireless docking connectivity for mobile client device (2 in 1, tablet, laptop) with up to 4.7 Gbps of bidirectional throughput. It’s available in the smaller M.2 Type 2230 form factor optimized for thinner and lighter mobile device designs. Complemented with the Intel® Wireless Gigabit ...Sink-M 13100, it enables wire-equivalent user experience for wireless docking, peripherals access and device-to-device communications. The Intel® Tri-Band Wireless-AC 18260 includes Intel® Dual Band Wireless-AC 8260 for 802.11ac, dual-band, 22 Wi-Fi Bluetooth* connectivity, higher capacity, broader coverage, and longer battery life. Intel® Tri-Band Wireless-AC 18260 supports innovative Intel-only features including Intel® Wireless Gigabit Docking, Intel® Wireless Display and Intel® vPro™ Technology.